I-15, exit 105. H. Rest area. Hawaiianesque lava flows with educational stops along the way. Paved, gentle 3/4 mile loop. A nice break from the usual rest areas and a good place to stretch the legs. I-84, exit 173. B, C. Park at Flying J. Twin Falls & Shoshone Falls. Gorgeous gorge, George. I keep wondering about places like this, how the horses knew not to fall to their deaths. Or how the buffalo allowed themselves to be herded over the edge in places like Madison Buffalo Jump State Park, Montana, and (even better) Head-Smashed-In Buffalo Jump, Alberta, Canada. Which brings me to the bungee-jumpers. Didn’t see ‘em. Crowds gathered to watch, but the impending sunset imposed a deadline on my ride. Instead I took an obligatory trip to the falls. Nice little ride. Head towards town on US-93, go across bridge, into visitor info parking lot, then go under bridge. The path parallels the rim of the gorge. Just as you settle in for a nice pleasant ride, someone obscenely plops a McMansion in the way. McBastards. Anyway, the easement takes you to Eastland where you take a left, and then left at the light onto Falls street. From there follow the signs. The park is down about three-quarters the depth of the gorge. Roundtrip it’s about 13 miles. If you need a workout, take the Canyon Rim trail. Very nice views. However, it dead-ends at the top (they got a theme going) and if you try to cut across the adjacent field the cops will gun you down. Really, it’s their firing range. I-90, exit 7. B. Idaho: exit 7 (weigh station). Face it: the DOT will get their jollies at your expense. Whatever. 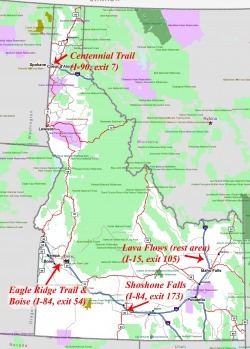 Jump on the Centennial Trail and ride into Couer d’ Alene, or go the other way and head towards Spokane. Whichever way you go you can be comforted that the DOT folks are still in their shack staring at trucks going by at 3 miles per hour (if you still think of them at all). Couer d’ Alene has a few fine dining options, and Spokane more so. I-15, exit 122. Sections of Butte, Montana are super fun. These areas are designated by signs that read: “Super fun site: Keep out.” Sorry. Seriously though, I did have a wonderful time riding around Butte. Copper mines rule the town with their black derricks braced against the wind like Eiffel towers with a purpose. These derricks also serve as memorials to dead miners. On the east side of town is the enormous open pit mine. Colorful. I intend to catch it at sunset someday. MB. I-90, exit 455. Park at the Pilot. The Zimmerman Trail is awesome, once you get there. Unfortunately, the ride there is just under ten miles, uphill. Not terribly strenuous, but time consuming. It took me an hour, nonstop. But, once there, wow! The monolithic slick-rock cliffs were once an irresistible draw to car-disposal enthusiasts. A few automotive skeletons adorn the cliff faces. (Factoid: garbage > 50 years old = artifact; garbage < 50 years old = garbage. Thoughtful consideration seems obvious if you plan to gift your garbage to the next generation – otherwise some inconsiderate slob might just pick up after you! And legally, too!) These days the slick-rock cliffs attract mountain-bikers, hikers, and lovers (make plenty of noise as you approach the latter). So, head west out of the Pilot parking lot on the frontage road, connect with the I-90 business loop (US-87) until the next stoplight, turn right, north on US-312 to 6th avenue bypass (half-way up the hill on the left), and another left on airport road (state route 3) – or, take the pedestrian/bike path just before airport road (longer, but no traffic for awhile). OR, if you have some miraculous, legitimate reason to be driving on state route 3, there is lots of parking available off the side of the road near the airport. Otherwise, keep pedaling past the airport until you pass the airport entirely and reach the next stoplight for Zimmerman Trail Road. The parking lot is on the left just past the stoplight.